This is a guest blog written by Dana Kovarik, a UCL student who has been volunteering with UCL Teaching and Research Collections over the summer holiday. Having been introduced to UCL’s collection of Robert Noel’s phrenological busts during a literature seminar on Victorian crime (e.g., The Strange Case of Dr. Jekyll & Mr. Hyde), I found there was still much work to be done in unravelling the mysteries of the collection. While the heads have been catalogued and a book by Noel outlining the biographies of each specimen was found at the British Library, details about his life and career were slim. 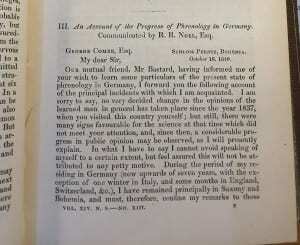 Upon volunteering, I was tasked by Nick Booth of UCL Museums with conducting a literature review. 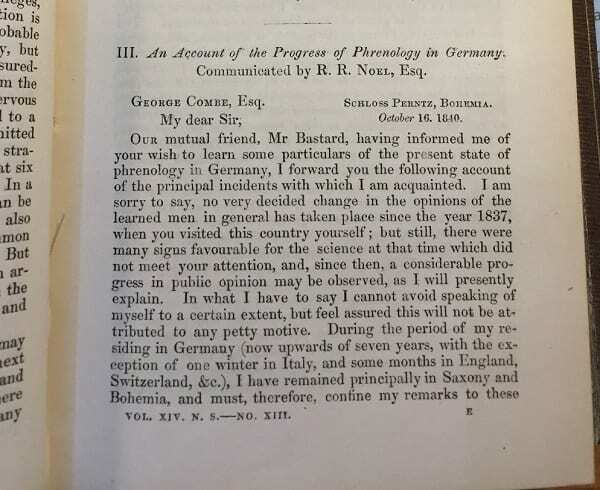 This involved finding articles by Noel and writings that reference his work throughout his career (roughly 1834-1880), in addition to mapping the developments of phrenology in Continental Europe during this time. An initial search of the UCL and British Library catalogues turned up, well, frankly nothing. 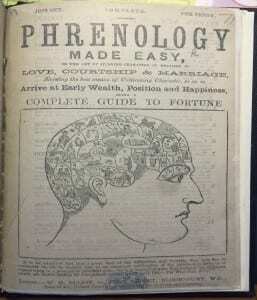 The British Library, however, contains hundreds of other nineteenth-century publications of various types on the subject of phrenology and so I decided to look through as many as possible in the hopes of finding leads. 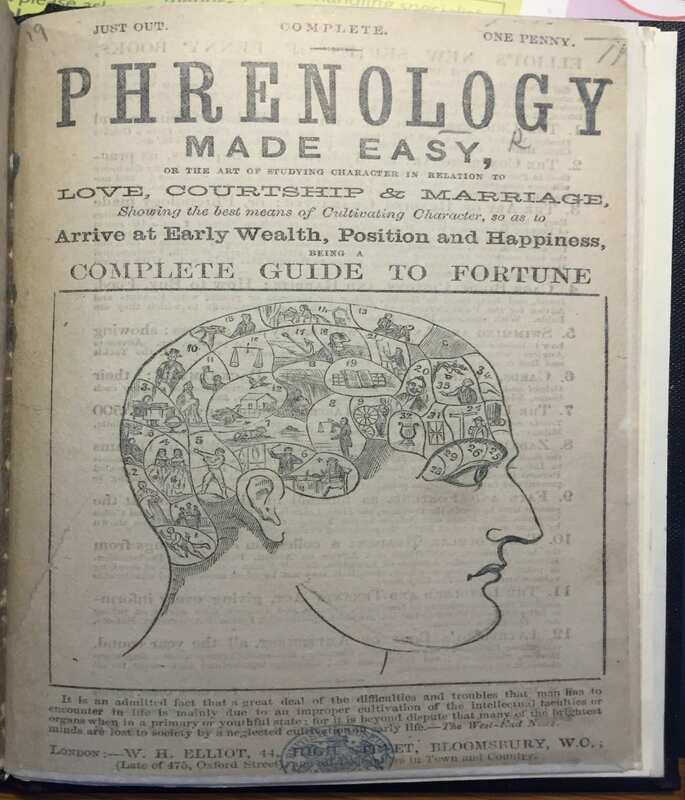 After wading through more serious inquiries into the philosophy (by people claiming it as a ‘science’) and copious examples of common ‘quackery’, I discovered a few contemporary phrenological journals (Photo 1). Although some volumes are accessible in digital copy, many exist only in the caverns of the British Library. Of course, scanning technology for facsimiles and physical books is at the most basic and time-consuming level – one’s own eyes. Luckily, I’ve managed to also rope my partner Mike in to help on the project so I have his eyes to rely on as well! At the beginning of the research Noel seemed a shadowy figure on the margins of the field, perhaps since it’s easier to find Insular (British) publications as opposed to Continental ones. Persistence is truly paying off, however. The deeper I dig through the annals, the more vividly I can begin to map Noel’s career. I’ve found he was essentially a ‘foreign correspondent’ for the Edinburgh-based Phrenological Journal & Magazine of Moral Science for part of the 1840s (Photo 2). This period of activity coincided with articles he published in the short-lived German journal, the Zeitschrift für Phrenologie. Translating, however, has been slowed by the rather esoteric vocabulary (and my rusty German!) 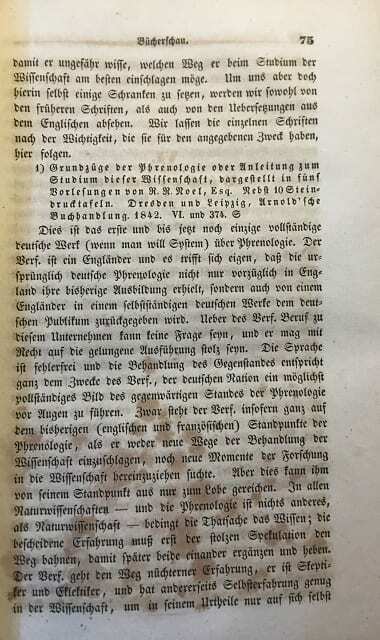 and the physical obstacles of an antiquated calligraphic German typeface called ‘Fraktur’ and heavy foxing on the pages of the 170 year-old journal (Photo 3). In fact, this part of the research has been by far my favourite – Noel has become a real historical mystery to me and adding foreign languages to the mix ups the ante considerably! The next step involves organizing my current findings into a catalogue, bibliography and timeline that maps not only Noel’s own activities and publications, but the general developments on the Continent. Further avenues for research open up frequently – such as collecting more information on Noel’s Bohemian associate Count Thun, from whose castle in Rosawitz he seems to have conducted a good deal of his activities. 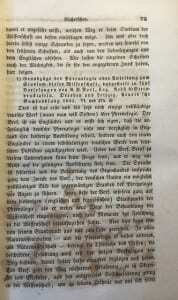 I’ve also found later English publications of Noel’s that include a book summarizing his lecture in Leicester in November of 1871 and further leads for other German publications. I hope searches of German library catalogues will prove fruitful. As Noel emerges from the margins to become a leading proponent of the hotly-contested field in Germany, I hope to piece together a comprehensive body of information about his career that finally links up with the donation of the collection to UCL by his descendants. Dana Kovarik is a UCL Student and Volunteer with UCL Museums.